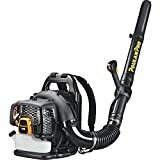 What is the Best Backpack Leaf Blower of 2019? The Husqvarna 350BT 50.2cc 2-Cycle Backpack Leaf Blower is the best backpack leaf blower you can get for the value it provides. They give you shade, fruits, and flowers. And they make your garden look beautiful. But that also means pain. The pain of cleaning up the fallen leaves that collect during fall. It’s tiring when you have to use the rake to clean up the pile of leaves. Things become tough when the leaves are wet and turned into a heavy mass. But that’s where a backpack leaf blower can make things easy for you. You can get rid of those leaves and debris without much effort. Let’s take a look at the best backpack leaf blower you can consider buying based on your garden needs. What is a backpack leaf blower? What are the different types of leaf blowers? Do you need a backpack leaf blower? How to choose the best backpack leaf blower? A leaf blower is an equipment that can help you blow away dried and wet leaves from your garden. It can be powerful enough to blow off twigs, sticks, and pine cones as well. You can use the leaf blower to collect them together and dispose of them. Using them as mulch or part of making your compost. A backpack leaf blower comes with the engine as part of a backpack you can wear. This helps distribute the weight evenly on your back and hips. You can use the blower for a long time without fatigue. You can get different types of leaf blower based on your needs. It could be handheld, walk behind, or backpack. The handheld ones are lightweight and easy to carry around but the power may be lower. The walk behind and backpack ones have a higher power. But the walk behind ones are heavy and difficult to maneuver. The backpack ones are portable and you get good power from them. They could be corded, cordless, or gas-powered. The corded leaf blower is lightweight and easy to use but it is limited by the extension cord you use. The cordless leaf blower is heavier than the corded one but it’s portable and easy to use. The electric leaf blowers create less noise and they’re easy to maintain. They also have no emissions. The gas-powered leaf blower gives you the most power because of a powerful engine. But this makes them heavier and difficult to maintain. They are noisy and have emissions. If you have a small garden with trees, you’ll need to clean up the wet and dried leaves that fall. You can use a rake to do this work and collect the leaves. But if your garden is a big one. Or you have a bad back, you’ll need a tool that can work for you. A backpack leaf blower can help you get rid of leaves and debris from your garden with minimal effort. You don’t need to worry about tiring yourself when using it for a long time in the garden. There are certain factors that can help you make the best decision when buying a backpack leaf blower. A backpack leaf blower can be expensive equipment and you want it to last for a long time. That’s why ensure you buy one that is durable and made with high-quality components. The power you need for your backpack leaf blower depends on how you’re going to use it. If you have a large garden with a lot of trees and debris, you’ll need more power. But if you have a small garden, you don’t need a high power one. The power of the backpack leaf blower depends on the type and model. Gas-powered leaf blowers are more powerful compared to electric ones. If you’re looking for a high-power leaf blower, go for a gas-powered one. If you don’t, a corded or cordless backpack leaf blower should be enough. The power of a leaf blower can be measured in Amps, Volts, or cc based on whether it’s electric or gas-powered. The backpack leaf blower can be corded, cordless, or gas-powered. If you want a high-power one, it’s best to go for gas-powered. But if you’re looking for something simple for a small garden, an electric one should do. A corded one is good if you don’t mind the limited mobility. It costs less compared to a cordless one. A cordless one gives you more mobility because of the battery but it costs a bit more. The electric ones have lower cost, lower maintenance, and no emissions compared to gas-powered ones. The speed determines the amount of air the backpack leaf blower can blow in a particular time. It’s determined by the RPM (Revolutions per minute) of the engine. And the MPH (miles per hour) of air speed from the blower. Or the CFM (Cubic Feet per Minute) that is the amount of air that comes out of the tube per minute. It’s not comfortable to carry heavy equipment on your back for a long time. That’s why you want your backpack leaf blower to have low weight. The weight of a backpack leaf blower can vary a lot depending on whether it’s corded, cordless, or gas-powered. The corded ones can be lightweight because they don’t have to carry a battery or a gas tank. The cordless ones can be comfortable even though they carry a battery. The gas-powered ones can be heavier than the electric ones. You should try them out and see how you feel using them. If the weight is well-distributed you should not find them a problem. If you have to carry equipment on your back, you want it as comfortable as possible. Select a backpack leaf blower that comes with comfortable cushioning for your back. And soft, comfortable straps that help you to carry it. Some backpack leaf blowers come with a waist belt which will help you carry it longer without discomfort. Ensure the handle is ergonomic and easy to hold and use for blowing leaves away. Some backpack leaf blowers come with air flow so your back remains cool even if the engine is working at full throttle. A gas-powered backpack leaf blower creates a lot of noise compared to an electric one. A good pair of earplugs can help you drown out the noise. But you should consider the comfort of your neighbors as well. Use the leaf blower at a suitable time. Or choose an electric one that makes low noise. It’s good to have a backpack leaf blower that works for a long time before it needs a recharge or refill. A corded one has unlimited power supply while a cordless one is limited by its battery. For a gas-powered backpack leaf blower, check the size of the gas tank. Check how efficient it is when burning the gas. Price should not be your first concern when buying a backpack leaf blower. A high-quality leaf blower might cost a bit more but it’ll last you for a long time. And you won’t need to spend your time and money on the maintenance as much. But if you’re looking for a backpack leaf blower just for the occasional work, take a look at some budget ones that are good enough. It’s nice when the backpack leaf blower comes with the longest possible warranty. That gives you an assurance to use the leaf blower without worries. The least you can expect is a limited one-year warranty while some may come with a limited four-year warranty. The first thing you need to do before using the backpack leaf blower is read the instruction manual. You should understand how to assemble and use the leaf blower. If it’s a gas-powered one, you should use the right fuel for it. A 2-cycle engine means you’ll need to use the right gas and oil mix. It could be something like a 50:1 gas to oil ratio but you should check the manual. You can mix your own gas and oil or buy an already created mix. If you have a 4-cycle engine, you don’t need to worry about mixing oil and gas. If it’s a cordless backpack leaf blower, make sure it’s fully charged before you take it out to work. A corded one has no problems except you should use a good outdoor extension cord. Know the direction of the wind before you start using the leaf blower. You want the wind against your back when doing the work. This will help the leaf blower get more power and be more efficient. It’s advisable to use the right safety equipment when using the leaf blower. Use safety goggles that protect your eyes from flying debris. Make sure your arms and legs are well-covered and protected from debris. If you’re using a gas-powered leaf blower, it creates a lot of noise. Use earplugs that protect your ears from damage. Consult with your neighbors on when you can use the leaf blower. Make sure it’s convenient for everyone before using it. You should clean the area of any heavy materials like large branches. Move heavy objects like tables or chairs out of the work area. Start the leaf blower and let it get warmed up for a minute before you start using it. Use the leaf blower in a semi-circular direction so you blow the leaves towards a single point. This will help you avoid spreading the leaves all around and make collecting them easy. You don’t need to use the full throttle all the time. It should be enough to use the leaf blower in short bursts to move the leaves. If a big pile gets collected, don’t try to push it with the leaf blower. Just pick it up and put it in a bin for collection. Don’t blow the leaves towards a wall as they’ll end up in your face. Rather blow them along the wall. Once you’re done collecting the leaves with the blower, turn it off and set it down. Check the parts of the leaf blower so they’re not clogged with debris. If they are you need to clean them with a cloth. If it’s a gas-powered one, check the spark plug, air filter, and carburetor. If there is any damage, you’ll need to get them replaced. The same goes for the fuel lines, filters, and cables that are connected to the gas tank and engine. When not using the gas leaf blower for a long time, empty the gas into a can and store it in a safe place. Keep the leaf blower in a place that is far from the reach of children and pets. The Husqvarna 350BT comes with a 50.2cc powerful 2-cycle gas engine that makes blowing wet and dry leaves a breeze. The offset handle helps you control the leaf blower with ease and prevents your arm from fatigue. There are dampeners between the engine and chassis so that vibrations are reduced. The Husqvarna 350BT comes with a padded harness and hip belt that will help you use the machine for a long period in the yard. It’s nice to have aruise control with a variable speed throttle. So you can adjust the speed on what you’re using it for. And keep maintaining the speed without much effort. The air purge will help remove air from the carburetor and fuel system so it’s easy to start. The Husqvarna 350BT weighs about 22.5 lbs which makes it comfortable to carry around the yard. It comes with a limited one-year warranty which is the minimum you can expect from a backpack leaf blower. The Poulan Pro PR48BT comes with a 48cc 2-cycle gas engine that is enough for blowing away wet and dry leaves from your yard. It has cruise control so you don’t need to hold the throttle constant as you’re trying to clean up the yard. The speed is variable so you can control whether you want to blow away dried leaves or some nasty debris. The speed of 200mph and airflow up to 475 CFM should be good enough to handle wet and dried leaves, grass, and other debris. The heavy duty frame makes this leaf blower durable so it lasts you a long time. The handle is ergonomic and comes with a soft grip that is easy to hold. It lacks a waist belt which would make it easier to use when carrying it for a very long time. The Poulan Pro PR48BT weighs 22 lbs which makes it lightweight enough to carry around in the yard for a long period as you blow away leaves. This leaf blower comes with a limited two-year warranty which is good to have so you don’t worry about damaging it while using it in the yard. The Troy-Bilt TB4BP EC comes with a 33cc 4-cycle gas engine which makes it easier to use than a 2-cycle one. The engine can produce 150 MPH air speed and 500 CFM air volume that should be good enough to blow away leaves and other debris. The engine has JumpStart technology which makes pulling the cord and starting the engine easier. The suspension system is good and distributes weight evenly so you should have no problems carrying it around. It’s good that it comes with a hip belt so you don’t get fatigue using it for a long time. The flex tube used for blowing leaves is easy to maneuver around and under objects. The Troy-Bilt TB4BP EC weighs 21.8 lbs which makes it lightweight and comfortable to carry around the yard for a long time. It comes with a limited two-year warranty in case there are manufacturing defects in the parts. The Greenworks PRO BPB80L2510 is a cordless backpack blower that comes with an 80V Lithium-Ion battery. It gives up to 145 MPH and 580 CFM blowing performance that is good enough for leaves and debris. The motor is brushless which enhances performance and makes it durable. It has a variable speed trigger so you can control the speed based on your cleaning needs. The turbo button helps you get power as you need. It’s good to have cruise control so you don’t need to keep holding the throttle button once it’s started. The Greenwork PRO BPB80L2510 comes with a limited four-year warranty which is the most you can get in this list of backpack blowers. The weight of this backpack blower is just 14.64 lbs because it’s cordless. This makes it lightweight and easy to carry around in the yard for a long time. It’s easy to start this blower with the push of a button. It’s easier to maintain and has no emissions when compared to the gas blowers. 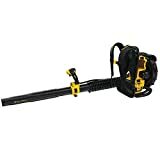 The DEWALT DCBL590X1 is a cordless backpack blower that comes with a 40V Lithium-Ion battery. It should be good enough to blow dry and wet leaves from the yard. The motor is brushless which means it’s efficient and will last you a long time. It can produce up to 450 CFM of air volume at 142 MPH. This leaf blower is compliant with noise-restricted areas and creates just 63 dB(A). So it’s quiet for your ears and your neighbors. Since it’s a cordless motor, you don’t need to worry about spending time on maintenance. It’s quiet and won’t create emissions. The batteries do take a little time to charge. The DEWALT DCBL590X1 is easy to start and stop with a trigger. 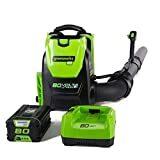 This backpack blower comes with a limited three-year warranty that is quite good. It protects you in case some problems arise while using the blower. This blower weighs about 31.8 lbs which makes it pretty heavy to carry around the yard for a long time. The Husqvarna 350BT 50.2cc 2-Cycle Backpack Leaf Blower is the best backpack leaf blower you can buy. The gas-powered X-TORQ engine give great performance for any types of leaves and debris in your yard. It’s ergonomic with reduced vibrations so it’s easy to use for a long time in the yard with comfort. The air purge that comes with this leaf blower makes it easy to start.